My skin & body care product obsession started at a young age. By middle school I was doing my own independent reading about – and purchasing of – beauty products. One of the first products I fell in love with was St. Ives Apricot Face Scrub. This product has achieved cult status over the years, and for good reason – it left skin super-soft and glowing. I was thus distraught a few years later when one of the big beauty books said that my scrub with natural exfoliating particles should be shunned, as these irregular shaped bits can cause tiny tears in the skin. YIKES. Never fear, they said – swap in a scrub with manmade perfectly spherical plastic “microbeads”! No more mini-tears; totally skin safe. This was all years before the green beauty movement took off, so no one really followed this thinking through to the obvious end…where we find ourselves today. These tiny plastic beads, which have become ubiquitous in thousands of products ranging from body scrubs to toothpaste, do not dissolve and therefore pose a major threat to the environment. In fact, a recent study reported that more than 8 trillion microbeads enter the country’s aquatic habitats daily. These seemingly innocuous microbeads have contributed to an increase in microplastic polluting the planet’s oceans and lakes, and pose a threat to aquatic life. These little plastic perpetrators have since been banned by public policy. However, if your favorite exfoliators contain these microbeads, you might be reeling over the ramifications on your skin. What To Use Now? What Works? I’m proud to say that here at Travel Beauty, we’ve only carried scrubs with natural exfoliating particles. By virtue of them populating our virtual shelves, you know they get our stamp of approval as an all-around excellent and effective product. So if you’re on the search for a plastics-free scrub, look no further. Here is our list of the best of the best. Lavido Gentle Exfoliator Peeling Cream: This exfoliator/mask is suitable for even the most sensitive skin. It contains Oyster Shell Powder and Pomegranate Peel Grains to provide a subtle scrubbing action, sloughing away dead cells and buildup. Scrub-a-dub for 20 seconds then leave on skin for another minute et viola! Glowing skin is yours. Yu-Be Foaming Skin Polish: I find myself writing about and recommending this face & body scrub often. Here’s why: At $18 (for an almost 7 oz) tube, it’s one of the best bargains in beauty. Because it contains fine grains of Rice Bran and Bamboo as well as gentle cleansing (no sulfates!) agents, this polish not only effectively exfoliates, but also works into a luxurious foam as you scrub, so no additional cleaning step is needed. Skin is left totally clean and ready to soak up your skin care products like a sponge. It also has Ginger Root, Ginseng Green Tea, Geranium Oil and Camphor – all benefit skin in different ways and give this polish it’s refreshing and invigorating scent. Mio Skincare’s Double Buff Dual Action Enzyme Exfoliator: you can easily buff away dull, lackluster skin with Mio’s Double Buff. This non-abrasive scrub is dedicated to revealing brighter, smoother, more even toned skin. In place of harmful buffing fragments, this omega-rich exfoliator utilizes perfectly spherical particles of pumice, lava and bamboo to gently but effectively slough away dead skin cells. Extract of Fig and organic Shea Butter hydrate and moisturize while organic Sweet Almond Oil soothes sensitive skin. The results? Smooth and supple looking skin with renewed clarity and radiance. Not only helping skin to look smoother and more even, its formula is packed with essential nutrients which work to maintain elasticity so skin looks and feels younger, firmer and extra dewy. Use on dry body, pre-shower. Like all Mio Skincare products, Double Buff is free from parabens, petrolatum, synthetic fragrance and colorants, xenoestrogens, PEGs, glycols and phthalates. Juara Invigorating Coffee Scrub: A much stronger choice of body scrub than the two mentioned above. This invigorating body treatment is made with Indonesian Sumatran Coffee Beans, finely crushed walnut shells and gentle, sulfate-free cleansing agents. This scrub will *wake you up* as it stimulates circulation, exfoliates, cleanses and helps to firm, tone and brighten skin. Coffee has been clinically proven to provide powerful antioxidant and tightening benefits for skin – hence the proliferation of coffee scrubs. Juara’s scrub was one of the first and is still the best in my book. This unique scrub also features Vitamin E-rich Rice Bran Oil, which provides additional hydration and helps maintain skin’s elasticity, leaving skin supple, soft and smooth. Many people have cured their pesky keratosis pilaris with it. A true therapeutic body ritual in a jar. 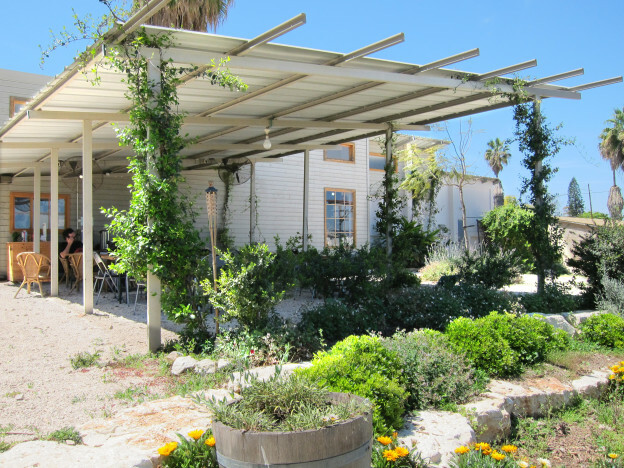 From our first visit to Lavido’s breathtaking organic farm located in the heart of the Galilee, we knew this product line was something very special. 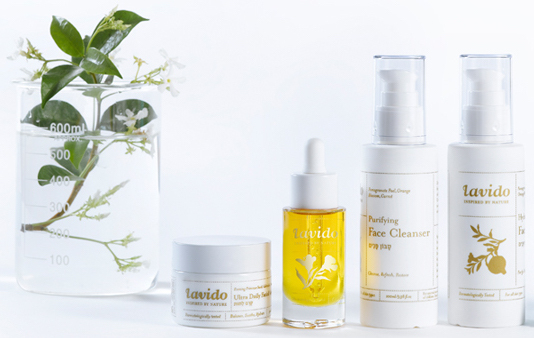 Lavido products combine the energy and vitality of the best organic, raw, plant-based ingredients with the invigorating benefits of volcanic thermal springs and purified waters from the Sea of Galilee. And, in a short time, Lavido has developed a loyal U.S. based following. Though the entire Lavido line is stellar, we wanted to highlight some of the unique, must-have products we especially love from this line. One of the active ingredients in the Age Away Hydrating Cream is organic, cold-pressed evening primrose oil, which gives the cream its yellow hue…not to mention many skin-saving benefits! Evening primrose oil contains a natural antioxidant that helps reduce wrinkles and fine lines. Thanks to another ingredient, attar of rose, it smells wonderful, too. This stuff works miracles: You can feel it hydrating and plumping up your skin almost instantly, yet it has a surprisingly light feeling on the skin. The Replenishing Facial Serum is not really a serum, but a luxurious oil blend, including organic pomegranate seed oil, distilled lemon myrtle oil and cold pressed mandarin oil. The oil extracted from the fruits’ seeds contain high concentrations of fatty acids that prevent premature aging and appearance of wrinkles. It also has healing properties that even out skin tone and texture and boost skin’s natural luster and vitality. A little of this serum goes a long way; two drops is really all you need. Replenishing Facial Serum is ideal for dry and/or mature skin, and is fabulous for use as a night treatment, especially as the weather gets colder. Hyaluronic Acid Alert Eye Cream is like bright eyes in a bottle. Formulated with plant-based hyaluronic acid, cold-pressed avocado oil, organic pomegranate seed oil and citrus extracts, it absorbs right into the skin and immediately hydrates, de-puffs and brightens the eye area. It is also clinically proven to significantly improve skin texture, firmness and elasticity. This cold-pressed oil is steeped in zinc and vitamin E, a super antioxidant, which combine to improve skin tone, rejuvenate the skin, and defy the aging process. This ingredient can be found in Lavido’s Age Away Hydrating Cream. Two types of rose hip are used in some of our favorite Lavido products. One is the food-grade extract in Alert Eye Cream, which provides an abundance of vitamin C. The other is infused oil, which is used in the Invigorating Facial Serum to calm, cool and soothe puffy skin. Pure concentrations of lavender oil extract contain disinfecting properties that aid in the healing of scars and dark spots as well as the reduction of redness and irritation. And of course, there’s lavender’s legendary aromatherapeutic benefits. Lavender can be found in many of Lavido’s products including Replenishing and Invigorating Serum, Hydrating Facial Toner, Purifying Face Cleanser, Gentle Exfoliator Peeling Cream and Bulgarian Lavender and Avocado Oil Aromatic Body Lotion. A root vegetable with ample benefits for the skin and hair, carrot is rich in beta carotene, vitamins A and C, minerals and antioxidants that combine to cleanse, brighten, and tone the skin, while helping to defy the aging process. Lavido Purifying Face Cleanser and Hydrating Facial Toner both contain Carrot Root Extract. Creating effective skin care products is no small feat! We love spending time with our brand founders to find out what inspired them to create their amazing products. Want to learn more? We sat down with Lavido Founder, Ido Magal, to discuss the genesis of Lavido. 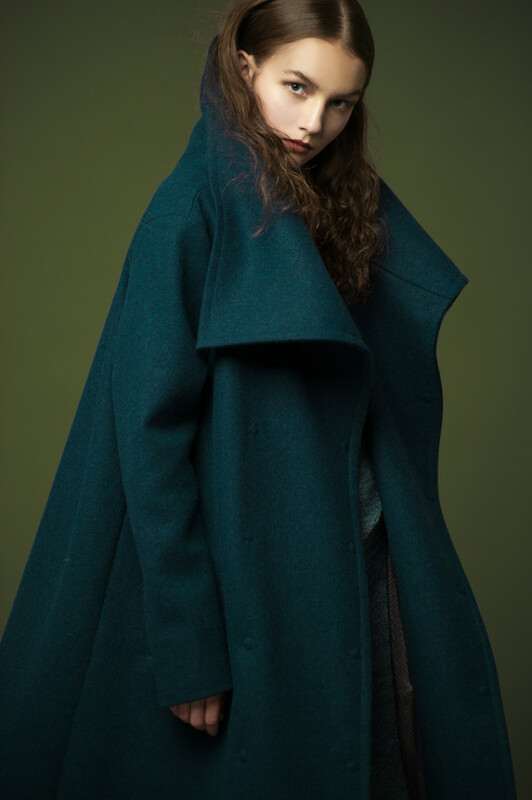 When cold, crisp winter weather makes our hair and skin freak out (i.e., break out…dry out…frizz out…), we make sure to stock up on our favorite multitasking product from Japan. No one can sing the praises of Vine Minus Ion Care Water better than Travel Beauty’s hair care expert, Ishi. Where do I begin? Vine Care Water is negative ion water that was first developed in Japan for NASA to clean the lenses and mirrors on space bound vehicles and satellites. Bacteria cannot live in a pH 12.5 environment, so it was made as a germ-killing cleanser. Negative ion water is 170 times more absorbent than water, so on its own it provides moisture. Used in conjunction with hair and skin care products, negative ion water works as a driver – so it boosts the effectiveness of products used subsequently. The negative charge of the water is attracted to – and bonds to – hair. It helps strengthen fine hair, making it feel thicker. It boosts the strength of conditioners, treatments and styling aids to amplify the benefits of these products. It can also be mixed with your shampoo or conditioner at a rate of 10%, or can be sprayed onto hair, roots to ends, before leave-in conditioners or styling aids are applied. This is a fabulous tool for thick, curly hair as well; read more here about how to use it. Put a few drops of oil into water. You will see it separates. Then spray the oil and water with Care Water. You will see it actually reduces the size of the oil drops so that the water and oil mix together. This is the same way Care Water breaks up and clears away oils on the skin. Sprayed on scrapes or cuts, Care Water cleans the wounds (by killing bacteria) and moisturizes, therefore promoting healing. It’s currently being used in research at burn hospitals in Japan with very positive results. Care Water also works for brushing your teeth – both cleansing and whitening. Read all about our smile-cleaning secrets here. Don’t swallow it, though! It is not for internal use. The pH is too extreme for that. 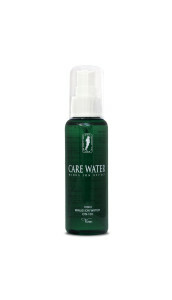 Care Water is the ideal multi-tasking travel companion. You can find this cure-all wonder water in travel size here at Travel Beauty. If you’re anything like me, traveling can have a way of forcing you into packing just the bare-bone beauty essentials needed for your trip. But what to choose? Your regular size beauty weapons or the mini versions of your must-have products? Take hair products for example – a 1 oz mini bottle of shampoo isn’t going to last you two weeks in Paris, now is it? What’s a girl to do? A mini toothpaste, however, can go the distance. There is the option, at many airports, to store your products for, a fee, until you get back from vacationing in Bermuda, but if you don’t want to part with your essentials, here’s what you need to know. I’d much rather have liquid than dry shampoo, but when you’ve only got a carry-on, what can you do? There are benefits to skipping the suds anyways, like creating volume and reducing the heat you use on your hair (hello, no more blow dryers). Yes, the dry version does the trick but if you’re really in need of a liquid shampoo the world famous, Philip Kingsley makes great travel size Jet Sets that contain a fantastic shampoo, conditioner and Philip’s award winning hair mask, Elasticizer, that are substantial enough to get you through at least 10 days. Even though most makeup is travel friendly there are some brands that create everything in perfectly travel-size packages. There’s a brand that I know, love, and use called Stowaway, based in New York City, that makes all of their beauty products in exactly the right sizes. You’ll never have to worry about your foundation being over the limit again! Another plus to having your beauty products in smaller packages is that you’re able to actually finish a tube of lipstick before it expires. How often does that happen? This isn’t something that comes to mind straight away when thinking of essential beauty products but water is an incredibly important part of your beauty routine – especially in flight. Water helps you stay hydrated and in return, makes you look and feel more beautiful – win, win! But don’t bring your own water because there are plenty of hydration stations around the airport to fill up on-the-fly. Beautifying yourself shouldn’t start when you land. It actually begins during the flight. With all that recycled air and drying temperatures, it’s essential to begin taking care of your skin while your seatbelt is still fastened. Apply a light face mask halfway through your flight. Heaven Skincare Silver Bee Venom Mask is my go to. You can apply it directly over your moisturizer and leave it on, it seeps right in with a dose of hydration. Don’t worry about getting strange glances from fellow passengers when applying your mask; they’re just envious of your well-packed travel kit. It is also essential to keep your lips moisturized. I’m partial to B. Kamins Lip Balm SPF 20. It can be applied right over lipstick or gloss and contains UV protection in case you are sitting in a window seat. You can actually get burned through the windows of an airplane. All you super light packets out there, this beauty product is for you. Introducing the one and only water spritz you’ll need to pack in your carry-on: Vine Minus Ion Care Water. This high-tech water, from Japan, does it all – seriously. It can be used for a quick refreshing spritz while in flight and on the go, but it’s also a hair volumizer & skin moisturizer, a makeup remover and setter and can substitute for toothpaste in a jam. So while this product is only one small bottle, it can take the place of so many others. If you’re really missing your full-sized beauty routine and need to work in an extra beauty boost, check out the many airport beauty services you can find in most airports.